"During the humanitarian action, even the attacks on the Jabhat al-Nusra terrorists were stopped in order to ensure the full implementation of the ceasefire. However, at 05:00 p.m. local time [15:00 GMT] a mortar attack was carried out in the area of the aid's unloading. There was no aviation over Douma at that moment," the source from the humanitarian task force of the International Syria Support Group (ISSG) said. The source stressed that Russian military had confirmed the humanitarian pause, as requested by the UN staff, to complete the unloading and distribution of humanitarian aid despite a threat to life. The supply of humanitarian aid to the Syrian town of Douma in Eastern Ghouta by a UN-Syrian Arab Red Crescent convoy was almost jeopardized by the two-hour talks between the convoy members and head of the local military and political councils. 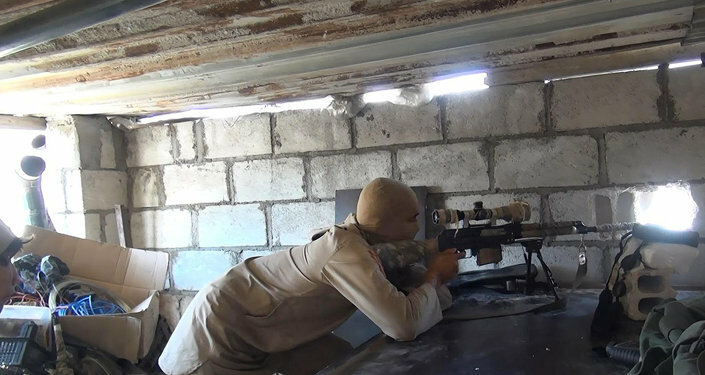 "After the convoy entered Douma, the talks between the convoy staff and leaders of the local military and political councils took place in one of the local mosques, being recorded on video, and the record was later used by the Jaysh al-Islam militants for propaganda purposes. At the same time, due to the two-hour delay, the delivery of humanitarian aid and medicine to civilians was in fact under the threat of disruption," the source said. The source emphasized that the humanitarian agencies were able to personally verify that militants forcibly kept civilians in the area as a "human shield." The source continued that it would have been impossible to send a humanitarian convoy of 45 trucks to Douma earlier this week without the help of Russian servicemen. "The residents asked the UN staff and convoy members to facilitate their evacuation from this zone, told that the militants are taking away their aid, forbidding them to leave their homes," he said. On Monday, for the first time since November 15, the joint UN and Syrian Arab Red Crescent humanitarian convoy entered Douma. After the convoy began unloading, it came under fire. The Russian side blamed it on the Jabhat al-Nusra militants while a number of Western countries accused Damascus. On February 24, the UN Security Council unanimously adopted Resolution 2401 that urges all opposing parties to immediately stop all hostilities and adhere to a long-term humanitarian pause across Syria in order to secure the safe and unhindered delivery of humanitarian aid, as well as medical evacuation of the injured. Russia also proposed an initiative of organizing a five-hour daily humanitarian pause to ensure humanitarian supplies and evacuations from the area. Russia considers statements by a number of Western countries regarding the March 5 air strikes in the Syrian city of Douma and accusations against Damascus preventing the passage of humanitarian aid, as playing into the hands of terrorists, a source in the humanitarian task force in Syria said. "Such statements of the West, cannot be seen as anything but as playing along with terrorists. We are used to such statements from pseudo-humanitarian organizations on the ground but were surprised to hear such unbalanced assessments from the leadership of Western states, including the United States and the European Union, as well as from UN officials. With these statements, they once again demonstrated that they are ready to go to the end in servicing radical groups," the source said. The source noted that many Western officials while sitting in comfortable offices, were ranting about the specifics of the humanitarian operation in Syria and did not want to notice the actions of the Russian side, which was rendering assistance to humanitarian operations in Syria directly on the ground. "At the same time, they not only do not want to notice Russia's actions to improve the humanitarian situation in Syria, but also steadfastly turn a blind eye to the situation in Raqqa, completely destroyed by the international coalition, where nothing is done for the demining, and where children die every day. In addition, the West is hypocritically continuing to link the allocation of funds for the reconstruction and restoration of Syria with progress in the political transition, thereby punishing hundreds of thousands of Syrians, including women and children living in the government-controlled territories," the source concluded. On Monday, for the first time since November 15, the joint UN and Syrian Arab Red Crescent humanitarian convoy entered Douma. After the convoy began unloading, it came under fire. The Russian side blamed it on Jabhat al-Nusra terrorist group (formerly known as al-Nusra Front, banned in Russia) militants while a number of Western countries and EU foreign policy chief Federica Mogherini accused Damascus. Mogherini stressed that "the mere presence of Hayat Tahrir al-Sham (HTS) in Eastern Ghouta cannot justify the continued indiscriminate shelling and bombing of the civilian population and of medical facilities," and noted that a five-hour humanitarian pause was insufficient. Some militants are considering accepting the offer of the Syrian military to leave Eastern Ghouta together with their families through the humanitarian corridor, Russian center for Syrian reconciliation spokesman Maj. Gen. Vladimir Zolotukhin said Tuesday. "According to information received by the center for Syrian reconciliation, in connection with the evolving humanitarian situation in the area of Eastern Ghouta, some militants are seriously considering the possibility of leaving the town of Douma with their families through the humanitarian corridor. At the same time, other members of illegal armed groups consider such action as treason,” Zolotukhin told reporters. On Tuesday, the Syrian military opened the humanitarian corridor in Eastern Ghouta not only for civilians but also for militants, offering them to leave the area together with their families. 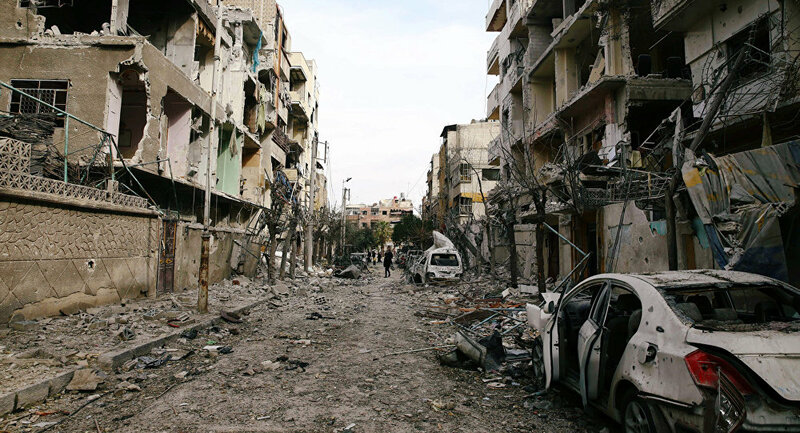 Eastern Ghouta was seized by militants in 2012. 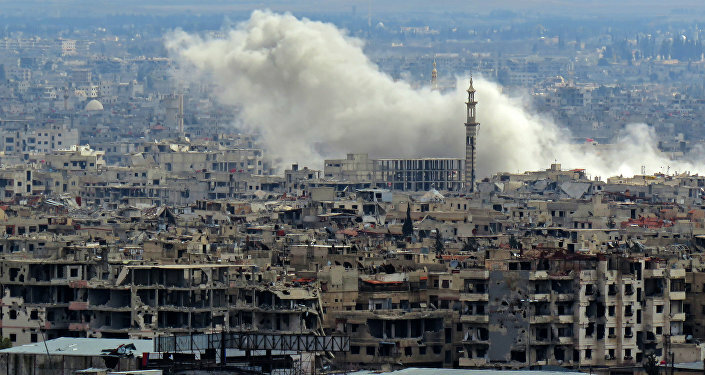 According to the Syrian Army estimates, there are 10,000-12,000 militants in the region. Despite the recent UN resolution, the fighting has not stopped, even when the humanitarian pause was in place, the Russian Defense Ministry's Center for Syrian reconciliation said. As militants constantly target all exits from the enclave, civilians have been unable to leave the area, according to the center. On February 24, the UN Security Council unanimously adopted Resolution 2401 that urges all conflicting parties to immediately stop all hostilities and adhere to a long-term humanitarian pause across Syria in order to ensure the safe and unhindered delivery of humanitarian aid, as well as medical evacuation of those injured. The ceasefire does not apply to ongoing military operations against the Daesh or al-Qaeda terrorist groups (both banned in Russia) and their affiliates. Moreover, Russia proposed an initiative of organizing a five-hour daily humanitarian pause to ensure humanitarian supplies and evacuations from the area. However, militants, operating in Eastern Ghouta continue shelling and prevent the humanitarian operations from being implemented.